Van Hool has entered into a contract with Transport for London (TfL) in the UK for the construction of two latest generation hydrogen buses. This new contract falls within the scope of 3Emotion, a European consortium on Hydrogen Fuel Cell Buses, in which Van Hool is acting as project coordinator. The hydrogen bus, which converts hydrogen into electricity, is currently one of the most environmentally friendly public transport vehicles: it offers local zero emissions (absolutely no harmful emissions or CO2) and significantly reduced noise levels. The two hydrogen buses for London are hybrid (fuel cell and battery powered) Van Hool A330 model 12-metre vehicles. They are equipped with the very latest FCvelocity-HD7 Fuel Cell module from Ballard Power Systems in Vancouver, Canada. The bus has 35 seats, space for one wheelchair user, and standing room for + 30 passengers. 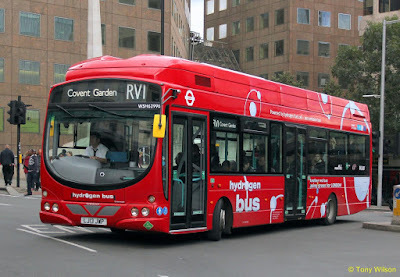 The vehicles will be put to use in London city centre, more specifically on the route RV1 which runs between Covent Garden and Tower Gateway. Filip Van Hool, CEO of Van Hool, is delighted with this new endorsement: “The fact that TfL, which operates a fleet of 9.050 buses, is ordering these buses from Van Hool, must be seen as a vote of confidence in this technology and our products. Van Hool has already supplied 49 hydrogen buses to the US and to European member states as part of other European projects, including five buses to De Lijn Antwerp. Van Hool was set up in 1947 and is located in Koningshooikt. The vast majority of items produced are destined for Europe and the US. Van Hool has over 4,800 employees worldwide, most of whom are based at the production facilities in Koningshooikt and Bree in Belgium, as well as Skopje in Macedonia.